Now, there was a little boy in the crowd. He had brought a lunch that his mother had made for him that morning. 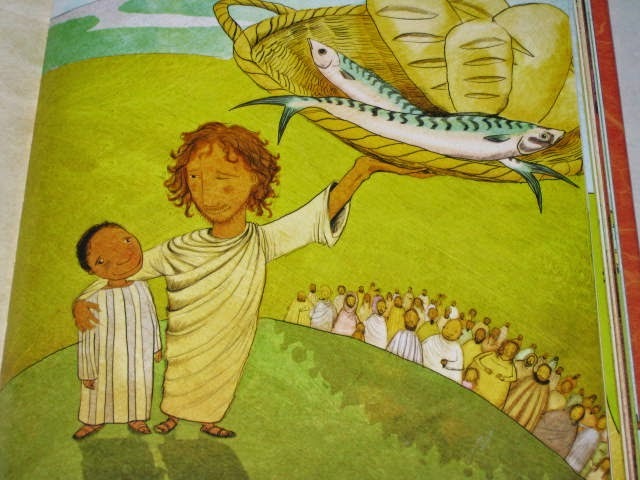 He looked at this five loaves and two fish. It wasn’t much – not nearly enough for 5,000 – but it was all he had. “I have some,” he said. Jesus’ friends laughed when they saw his little lunch. “That’s not nearly enough!” they said. But they were wrong. Jesus knew it didn’t matter how much the little boy had. God would make it enough, more than enough. As Jesus’ friends started to hand out the food, do you know what? It was the strangest thing, no matter how much they broke off – there was always more. And more. And more. Enough for 5,000! Well, Jesus did many miracles like this. Things people thought couldn’t happen, that weren’t natural. But it was the most natural thing in all the world. It’s what God had been doing from the beginning, of course. Taking the nothing and making it everything. Taking the emptiness and filling it up. Taking the darkness and making it light. I started crying when I read the passage above with my 6 year old the other day. I’m not sure if she noticed my voice cracking and my eyes filling up with tears, but if she did, she didn’t ask me about it. See, this has nothing to do with my lunch – but everything to do with my life. Because I often feel like I am not enough. My kids need my energy and my love, my husband needs my care and interest, the youth group girls need my listening ears, my job needs my fully-functioning and wide-awake brain, my laundry and dishes and floors need my time, and sometimes I just laugh when I see how little I have to give. IT’S NOT NEARLY ENOUGH! I half-yell inside my head. I don’t have enough time for the dishes or enough ears to hear all of the stories or enough love to get through bedtime with small children or enough brain-waves to push me through the next project or enough selflessness left for my husband. Do you know what? It is the strangest thing, no matter how much I break off – there is always more. And more. And more. Enough for three small children and one more load of laundry and the dishes [again] and my husband and the project and then the three small children again and the youth group kids and…! It reminds me of the most difficult point of my most difficult labor [which happened to be with my youngest child… which may explain WHY he is still the youngest child]. “I CAN’T DO THIS!!!!! !” I screamed. And my angel-nurse responded ever-so-gently-and-firmly, “But you are doing it.” The most profound statement I have heard at precisely the moment I needed to hear it. I really can’t do this. I don’t have enough. Not nearly enough. And yet – I am doing it. Because I bring what little I have to “the One who made all the fish in the oceans… the One who in the very beginning had made everything out of nothing at all.” (p. 246, Jesus Storybook Bible) And then He makes it enough. More than enough. Well, Jesus did many miracles like this. Things people thought couldn’t happen, that weren’t natural. But it was the most natural thing in all the world. It’s what God has been doing from the beginning, of course. Taking the nothing and making it everything. Taking the emptiness and filling it up. Taking the darkness and making it light. May Jesus fill your nothing today, and make it everything. May He take your emptiness, and fill it up. And may He take your darkness, and make it light. Because when you don’t have enough… He does.